I am a bit obsessive about homeschool curriculum, and I have read about many, many writing programs, but I had not heard of Essentials in Writing before having the opportunity to review it. It's a complete language arts curriculum, and is available for grades 1-12. I was pleased to receive a copy of Essentials in Writing 6th Grade, and I used it with Emma (7th grade) and Abbie (6th grade). 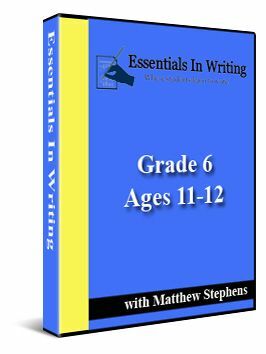 Essentials in Writing is set up with grammar lessons for the first part of the book (lessons 1-25 in the 6th grade program), and then writing lessons for the remainder (lessons 26-68). There is a video to watch for each lesson, taught by Matthew Stevens, who was a middle school teacher before developing this writing curriculum. I found his lessons to be clear and engaging, and my girls enjoyed them as well. You can see a sample 6th grade lesson here. The recommended approach is to have students look at the day's worksheet, then watch the video and complete the assignment. Once they're done, they should look over the next day's lesson so they're aware of what's coming next. Both girls enjoyed using this program. Well, the younger one said she didn't mind it, which means she liked it a lot. :-) The older one felt that it was easier to understand than the other program we'd been using, and I attribute that to the DVD lessons. She also said she would not complain when we continue to use it. That's some high praise from my "tweenagers," I assure you. I did learn while working through this program that my girls really need practice reading directions and completing an assignment by following a given example. We've done informal grammar instruction up to now, and our writing has been primarily copywork and narration, so they have not done many worksheets. Once they did their EIW lessons, we went over them together, and that made for some good discussions. When I pointed out mistakes, they were able to see what they'd done incorrectly right away, and I hope it's helped them see that reviewing their work before turning it in is a good idea. Each level of Essentials in Writing is $40. You will receive two DVDs with the lessons, and a PDF copy of the workbook via email. It's a good-sized workbook, and they also have a pre-printed Optional Workbook available for $20 if you'd rather not do the printing yourself. When I had questions, I received answers quickly and appreciated their customer service. I like this curriculum. I like that both grammar and writing are taught, and how each year builds on previous knowledge. I love that poetry is included! It's a great program at a great price. It's definitely worth checking out!